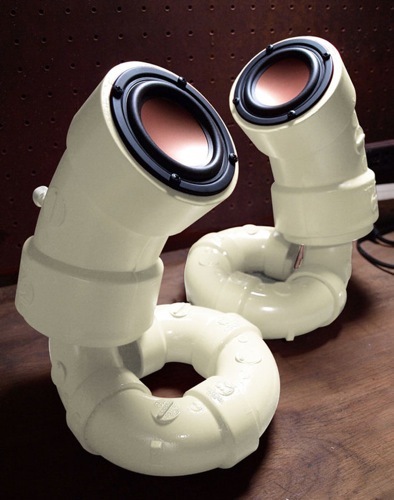 These handmade speakers named, White Sea Cucumbers, keep your audio equipment looking a little on the industrial side. The name itself is more than a little flaky considering the materials used, but you can just call them PVC speakers to your buddies. It might be worth it to actually have a set of speakers that aren’t quite as mass produced as the others out there on the market. Each of the pipes holds a 3 inch magnesium/aluminum alloy range driver. They’re said to have nice sound with a lot of low end bass for such a small speaker. The frequency response is 80-20,000. In order to get them up and running you’ll need a separate amplifier or purchase a mini amplifier through the same seller that has these little pipe speakers. You can pick up this particular pair for $199 through Etsy.